The break to the nine-month blogging hiatus is going to be about what has become a regular, semi-daily routine for me: biking. My first bike here was an Oyama folding bike, which I bought on my first year. The justification in getting one boiled down to why-not, because-I-can, and this-is-China-bikes-are-everywhere. I chose a folding bike mainly because of my apartment situation (fourth floor, no elevator). Yes, I can park the thing somewhere else relatively safe, but it will surely stick out all black and shiny, among its rusty, dilapidated cohorts. Several years and apartments later, I decided to not have anything to do with it -and biking- after an accident. Yes, it didn’t really go far, and the most excitement I had with it was going around, scouting photo opportunities during Chinese New Year festivities, and riding the Huangpu River ferry from Pudong to a stop around The Bund. 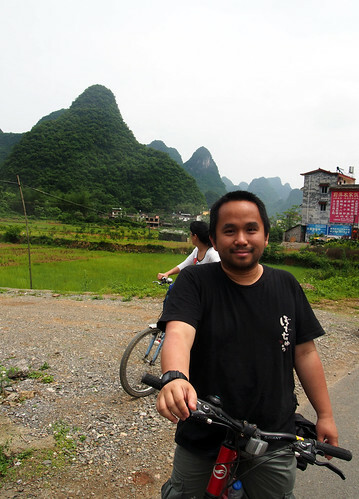 I swore off bikes for a time, until when I had to use one to ride a bike trail with a group around Yangshuo (read about it here) late June, last year. Riding almost non-stop for 6 hours had me crawling for my bed -since I could not stand on two feet- at the hostel right after, but the realization that I had enough stamina to go through this means one thing for the solo-traveller self: I may not have the knees or footing to trek mountains, but maybe, just maybe, I’m a competent-enough biker. The second bike fell under the category of ‘leisure mountain bike‘, which met my allotted 1000 RMB budget, and since there was a Decathlon (a sports equipment superstore, where I also bought my first bike) nearby, I got one of the BTWIN-brand one, and by the first or second week, I’ve stripped off the stickers from it, since there was still this paranoia it might attract thieves. It only went for errands the first few months, until I discovered people at work who travel on bikes much, much farther. 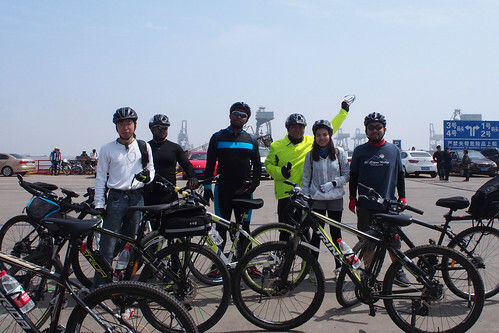 The first group ride was set for Chongming Island last April. Total distance was around 80 kms, and we reached the island by ferry. Most of us were first timers, and we didn’t really have much of a chance to go around, but reaching the place was already something worth noting. We started from Zhabei district mid-morning, had lunch at our destination past noon, and arrived back at the Shanghai mainland before dark. Waiting for the Chongming Island ferry, with friends from China, Korea, Thailand, and Madagascar. Resting around Chongming Island brick farmhouses. 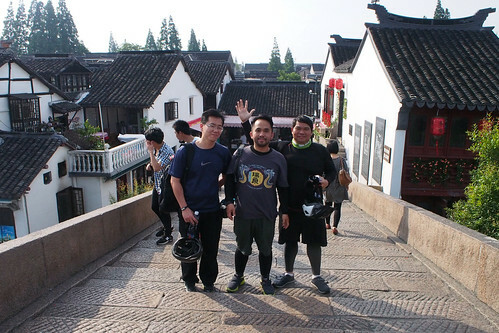 The next ride was for Kunshan (Jiangsu Province) last May, which will be my first time riding out of Shanghai on a bike. Total distance was 170 kms, and my basic setup held up pretty well. Yes, it weighed a lot more than others, and everyone else had disc brakes, but like the first ride, I didn’t struggle, and whatever riding skills I had appeared to be sufficient. Pre-ride group photo. First timers include two fellow Filipinos joined, and our sole lady from Japan. Since we were set for this only as a day ride, we did not have much time to go around, and left late afternoon. 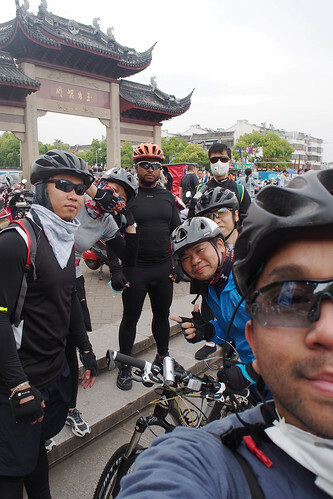 A Zhujiajiao group ride was set for June, a water town on the outskirts of Shanghai, and it was located a little farther than Chongming Island, albeit a different direction. The challenge here wasn’t the distance, but that I was the least experienced biker of this small group. I simply couldn’t keep up on the way there, and I can’t just blame the Shanghai summer heat on this. We did not make the usual gas station pit stops, as I had enough unplanned ones I had to take from exhaustion. We reached the water town early afternoon, and I was already thinking of a backup plan to travel back. Hop on a tourist bus and hope they can accommodate a bike in their luggage compartment? I persisted, however, and surprised myself, and everyone, on the way back. I wasn’t holding up the ride anymore, and the four of us looked like any normal weekend bike crew, minus an obvious weak link. Zhujiajiao is very commercial, and very touristy. Also, indulge me on this: compare the first photo on this post, and the photo above. There you go, my before-and-after weight loss selves! I suppose I can severe my dependency on group rides, and just set myself up with a navigation app to help, but at this point, I’d rather build up the experience first. I’ve also told myself I could upgrade, but I don’t really find any big fault with the rig I have now, as much as I would like to get a road bike, primarily for the satisfaction that I’m not just settling. A good number of friends back home look like they are into biking, and seeing their nice bikes, and how active they are with their respective rides, as seen from my Facebook feed, must be motivating, considering the apparent advantage of having actual bike lanes over here. Much like my other big hobby though (photography), I’m on the side that the best way to gratify oneself here is not to bask in online discussions, get sick with illogical gear envy, but to just go out, and ride.